Dimerostemma, as circumscribed here, contains 25 species, 19 of which occur in Brazil. The Brazilian species of the genus are revised in the current treatment. The greatest concentration of species is in cerrados and campos rupestres of central western Brazil. 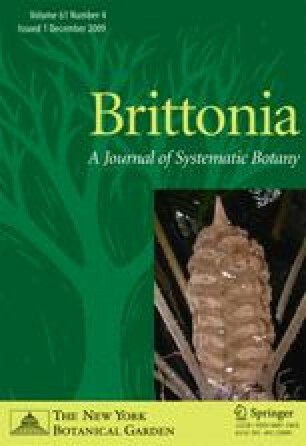 One new species (Dimerostemma paneroi) is described, illustrated and discussed, a new combination (D. oblongum) is proposed, and lectotypes are designated for D. arnottii, D. goyazense, D. lippioides, D. pseudosilphioides, D. vestitum, and Verbesina arnottii var. angustifolia. A key to the Brazilian members of Dimerostemma is provided, along with synonymies, descriptions, illustrations, and discussions of the species. This paper is part of the first author’s doctoral thesis submitted to the graduate program in “Biologia Vegetal” of the Universidade Estadual de Campinas, SP, Brazil. The first author gratefully acknowledges the late Graziela M. Barroso for her supervision in the first two years of this thesis, and thanks the members of the doctoral committee, George J. Shepherd, Jimi N. Nakajima, Julie H. A. Dutilh and Volker Bittrich for their suggestions. Appreciation is expressed to José F. M. Valls for field support in the states of Mato Grosso do Sul and Goiás, and Vali Pott and Arnildo Pott in the state of Mato Grosso do Sul. MDM wishes to thank Regina C. de Oliveira, Geraldo Damasceno Jr., Ana Kim and Angela Sartori for extending hospitality or help during the field work. We thank Volker Bittrich for kindly photocopying most of the protologues in the libraries of Europe and the USA. We are greatful to José L. Panero for editing the manuscript and to Patricia Eckel (MO) for the correction of the Latin diagnosis. Many thanks to Harold Robinson and Mauricio Bonifacino for helpful comments. We also wish to thank the curators of the following herbaria for loan of specimens: C, COR, CPAP, CTES, F, HB, IBGE, M, MBM, MO, NY, R, RB, S, SP, TEX, UB, UEC, US, Z. A fellowship was received by MDM for the first year from CAPES and for the following three years from FAPESP (98/12857–1). Figures 1, 2, and 4 were drawn by Rogério Lupo and Fig. 3 by MDM.